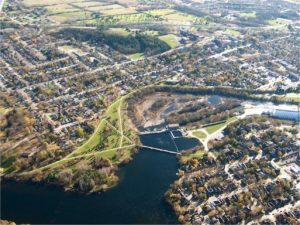 Being a resident or visitor to the City and County of Peterborough (Peterborough), it is easy to be aware of the abundance of waterways and lakes in the area. The community relishes in summertime boating, fishing and swimming, while also enjoying the winter months snowmobiling, ice fishing and skating. Waterfronts provide a gathering place for community events. The waterways can offer a range of outdoor recreational activities and, importantly, they supply vital electricity using the technology of falling water. From charging what we now deem as necessities – like cellphones and iPads – to the full-on load of powering local homes and industries, waterpower supports Peterborough residents’ very livelihoods. Peterborough boasts seven waterpower facilities within its core, spread along the Otonabee River. This is also home to the beautiful Trent Severn Waterway National Historic Site with 386 km of canals, 44 locks, 39 swing bridges, and 160 dams/control systems connecting Lake Ontario and Lake Huron. Many of the waterpower facilities in Peterborough and Trent Severn Waterway infrastructure can be seen along the beautiful Rotary Greenway Trail. 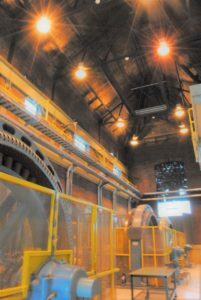 Waterpower in Peterborough has been continuously providing electricity for the last 135 years. Each facility is unique in its own right and connected to a particular era. In an age where climate change is extremely threatening, renewable waterpower provides a solution in the form of affordable, reliable and sustainable community power. If facilities could only talk, they would indeed chat about their personal background, how business has changed and would view themselves as a necessary persistent community member. Below are the stories, in chronological order, of each of the seven waterpower facilities. Highlighting how they came to be and how they will continue to support this unique, innovative and ever-evolving community. The oldest facility in Peterborough, and arguably Ontario, is the London Street Generating Station. This particular facility is in the city’s urban center. The station’s Plant #1 was originally constructed to supply power to the American Cereal Company, which became Quaker Oats. Peterborough Utilities Inc. (PUI) acquired the station from Quaker Oats (now Pepsi QTG) in 1975. Abundant and inexpensive hydroelectricity is why Quaker is a major fixture in the downtown area. PUI invested approximately $35 million in the expansion and life extension of London Street. The new London Street Plant #2 achieved operation on July 29th, 2016 and interior restoration of the original Plant #1 was completed in 2018. PUI also put a significant amount of time and effort into upgrading public safety and improving the surrounding environment. The combined upgraded plants generate enough electrical power to supply the needs of approximately 5,700 homes in Peterborough. The historical Pump House is on the west bank of the Otonabee River in the northern part of Peterborough and is also owned by PUI. 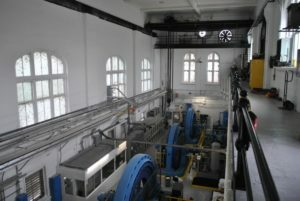 The heritage value of the Pump House lies in its association with Peterborough’s early waterworks system built to satisfy the town’s need for a public water system. The William Hamilton Manufacturing Company of Peterborough won the contract to supply the pumping machinery. In 1909, another pump house was constructed downstream and the machinery was moved into the new building. In 1935, Waterworks Superintendent Ross Dobbin brought two alligators back from Florida as a gift to the City and housed them in the 1893 pump house. This was the beginning of Riverview Park and Zoo. In 1946, the Old Pump House became the permanent home of the zoos monkey collection. In the early history of power development in Peterborough, a woollen mill company obtained water rights on the Otonabee River at a point situated north of the city limits. A few years later, a timber dam was built. The power obtained was utilized for driving a woollen mill on the east side of the river and to generate power to the city of Peterborough. Later, the power plant was purchased by the Auburn Power Company, which operated for several years utilizing water from the old Auburn woollen mill dam. Power and light were distributed to Peterborough as well as to the Peterborough Radial Railway company. In 1910, the Auburn Power Company was purchased by the Electric Power Company. The purchase included the water rights of the Auburn Woollen Mills Company. A larger development was planned to economically utilize the flow of the river at that point. In October 1910, work commenced on an entirely new and up-to-date plant, which was placed in operation in early 1912. 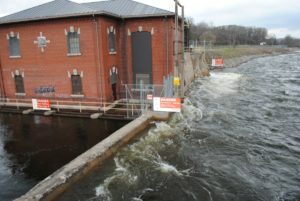 The plant is now owned by Ontario Power Generation (OPG) and is parallel on the Otonabee River with the Peterborough Pump House located upstream and the London Street station downstream. Just North of the previous three waterpower plants, the Stanley Adamson Generating Station originated in the late 1890’s, at which time a powerhouse was built on the west bank of the Trent Severn Waterway. 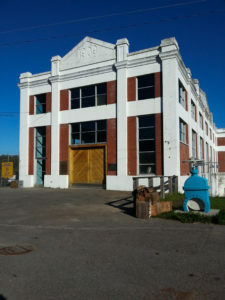 It was decommissioned and in 1921, the equipment was relocated to a new powerhouse on the east bank, designated as the Stanley Adamson Powerhouse. Stanley Adamson served as the first Chairman of the Property Committee at Trent and was responsible for the University acquiring much of the Nassau Campus, including the powerhouse, as a gift from General Electric. In November 2012, Trent University and PUI signed an agreement to create Trent Energy Inc. This company was responsible for a $22.8 million upgrade to the Stanley Adamson Power House, which was completed in 2013. 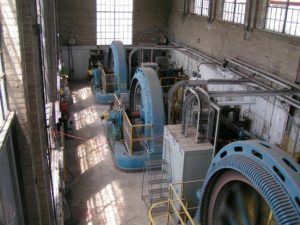 Trent is the only University in Canada that owns an operating waterpower facility. North of the City of Peterborough is the quaint town of Lakefield, part of Peterborough County and Selwyn Township. The Lakefield station was constructed by the Canada Cement Company and is now owned and operated by OPG. It originally supplied power to the Canada Cement Company’s Mill at Lakefield along with the Young’s Point and Douro power stations, both of which were retired from service in the 1940s. These stations were purchased by the Hydro-Electric Power Commission of Ontario in the latter part of 1936. The facility provides enough energy to power about 1,000 homes each year. The Cordova Lake Dam Station is located west of the City of Peterborough in the Peterborough County and the Township of Havelock-Belmont-Methuen. 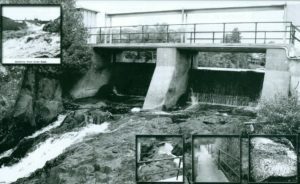 The Ontario Ministry of Natural Resources released a Crown-owned site to the private waterpower industry as part of the small hydro site release program initiated by the Ontario Government in the mid-1980s. The Cordova Lake Dam Generating Station was then built on this site and has been in operation since October 1992. Since that time, the plant has been operating with less than 1% down time and has generated over 2,400 MWh of electricity. Algonquin Power Systems is responsible for the management and operations of the plant. Cordova Lake Dam is located on the Crowe River at the outlet of Cordova Lake. The total cost of the Cordova Lake Dam project was $1.6 million. The newest community facility was built about a decade ago. 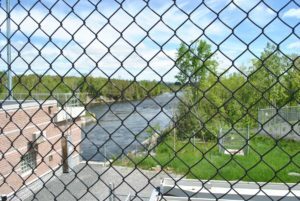 The Robert G. Lake Generating Station is a run-of-the-river facility on the Otonabee River adjacent to Locks 22 and 23 on the Trent Severn Waterway. The powerhouse and southern portion of the power canal is situated within the City of Peterborough on land leased from Trent University while the intake structure and northern portion of the power canal is located within the Township of Selwyn. The facility operates under a waterpower license with Parks Canada. Construction of the Robert G. Lake Generating Station commenced in April 2008 and was completed in December 2009. The facility is owned by Trent Rapids Power Corporation (TRPC), a wholly owned subsidiary of PUI. This facility produces enough electricity to meet the needs of approximately 3,000 homes. By living in Peterborough and the surrounding area, near the beautiful rivers of the region, we all enjoy the benefits of waterpower. The community has certainly been a waterpower champion for over a century. 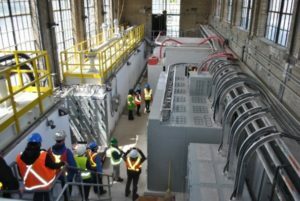 As emphasized through the facilities above, waterpower has strengthened Peterborough’s ever-changing economy and will continue to do so long into the future. As early as 2024, Ontario will need more electricity due to the retirement of nuclear assets. More energy will also be needed, since electric vehicles are no longer a distant possibility. There is still untapped potential at existing dams and locks that currently do not supply electricity, but are serving alternative purposes, like flood control, navigation and water management. 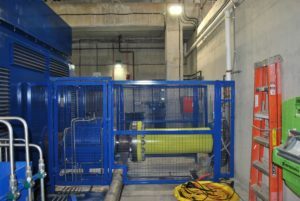 Waterpower development and retrofitting has been an ongoing practice and demonstrated in many of the above facility examples. As the community inevitably continues to evolve, taking advantage of some of this existing infrastructure will be a great opportunity for long-term prosperity and sustainability.